Also called hawking, falconry is a hunting method, using a wild falcon as the weapon to catch prey. Some falcons are trained not to kill the prey, while others are expected to do so immediately, depending on the hunter's preference. Falconry is complex and time consuming and is not a hobby, but a devoted lifestyle. 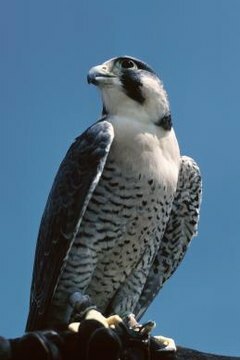 Falcons do not bond with their humans but are willing hunters as long as they are well treated and rewarded for their efforts. Many falconers use voice commands to emphasize what they want from the bird. Some consider this unnecessary because the falcon responds to food as easily as voice. Food can be a drawback however, as well-fed falcons hunt lazily. Hunters also use whistle tones to command the bird, but the whistle can be drowned out by bird calls or loud music. The hunter's voice is heard by the falcon for miles and some birds are trained to respond only to voice. The falcon remembers the falconer's voice and returns at his command, lands in a certain spot chosen by the falconer, makes a kill or flies in search of prey; all done in response to voice commands. The falconer who voice trains the bird is the only person that particular falcon will respond to during the hunt, as this person is the one who has always fed the bird and cared for her during her captivity. Falconry training is time consuming and requires effort and devotion to the bird. The falconer must spend time with the bird each day, and learn the bird's habits and personality to understand how falcons hunt. Talking to the bird is a natural extension of this training, as the bird becomes part of the falconer's life. While the bird doesn't bond with the falconer, she remains with him because he treats her well and feeds her. Having excellent vision, falcons are trained to respond to visual stimuli as well as verbal. The falconer raises an arm to call the bird back or uses another visual command to get the bird to fly in a particular direction, or to circle an area. But visual commands cannot be used exclusively as the bird doesn't have her eyes on the falconer during the hunt. Combining the visual commands with verbal or whistled ones keeps the falcon on track. North American Falconer's Association: What is Falconry?